now that it’s summer, shall we put these thoughts on the back burner? This was the start of a story that my fourth grade son brought home from school earlier this year. I asked him about it, but he didn’t want to say much except that the first sentence had been given to the class and they were asked to continue the story. Not long before that, the same son had asked me whether I ever used to feel scared about going to school. My heart felt heavy. How have we gotten to this place where school and violence are so often associated with each other? In March I claimed a half-day assignment in a second grade class at a school on St. Paul’s east side. Ms. Romo, the classroom teacher, had requested a half day off of teaching to catch up on paperwork and I had taken over her role midday. Just a few minutes after Ms. Romo left the room, a school staff member announced over the intercom that we’d now have a “lockdown with warning.” When they had heard this, the second graders scrambled out of their seats toward the wall farthest from the classroom door. Someone turned out the lights, a few other students started pulling down window shades. Two girls started crying. Actually one had been whimpering ever since she’d come back from the buddy room. There she’d heard from another student that Angel had “almost got kidnapped” during recess, which sounded hard to believe to me, but had sent this young girl into a panic. There was a knock on the door, only adding to a sense of fear that had been rising in the classroom. They seemed to be afraid that someone was coming for them. Then we heard the key turn in the lock. Ms. Romo entered the room just as emotions were nearing the point of hysteria. I took a deep breath, thankful that a trusted adult could help me calm them down. I wanted to believe her – as I’m sure many of the children wanted to believe her – but hadn’t they heard too many news reports to the contrary? Just the month prior, in Parkland, Florida, 17 people were killed. Not long after this incident, in a high school in Santa Fe, Texas, 10 were wounded and 10 killed. The New York Times has labeled us “a nation plagued with mass school shootings.” I read that one reporter interviewed a student in Santa Fe and asked if there was a part of her that thought this would never happen at her school. The student responded, “I’ve always kind of felt like eventually it was going to happen here, too.” Who could blame the kids in St. Paul – including my own – for thinking any differently? Our ten-year-old has become known for devouring thick books, but he has very definite ideas about what he likes to read. He’s recently made it though the Percy Jackson & the Olympians series and has moved on to Heroes of Olympus. A few weeks ago he was a bit agitated when he was out of said reading material and still had one more day to go before his next library visit at school. His affection for 500-plus page tomes sometimes leaks out as scorn for picture books, a sentiment that his younger brother has picked up on. Not to be left behind, our seven-year-old has also expressed a preference for chapter books. Trouble is, he can’t read too many of those himself. I considered it a victory for the picture book, a subtle reminder of the power of a good story to engage, amuse and provide fodder for conversation. When the play date was over, we had a lot of things to pick up and put away, but I had good help. And I have few complaints of this kind of play: two boys enjoying each other’s company as they mostly do their own thing, but everyone once in while cooperate to make things go better – or have a brief conversation. Somewhere along the way, play tends to get more complicated so that by the time you’re eight you’re much more likely to be absorbed in someone else’s script. Earlier this year and at the end of last, our second grader was consumed by Star Wars. (No coincidence that it started shortly before the release of the latest Star Wars movie.) There was – and still is – a lot of Stars Wars going on at the school playground, if my son’s stories are any indication. The boys who have seen the movies or have some other good source of Star Wars information are the ones who get to tell everyone else how to play. They teach the others the names of the good guys and bad guys, explain who does what, when and how … In such games, my son is a follower. He hasn’t seen the movie – and most probably won’t for several years since it is rated PG-13. Maybe that’s not quite as big of a deal now as it was three weeks ago, though. Because that’s about when our second grader came home with four Pokémon cards that Eli had given him at school. Since then there has been no rest about adding to his “collection.” More specifically, he believes we need to go out and buy some more cards. Right. Now. (I’ve put him off till the end of February at least. I hope they’re on to a new topic by then.) It’s the same scenario about following someone else’s script. The kids with the most knowledge about the Pokémon trading card game are the ones who dispense information about this fictional world, including details such as who is a “fire type” – and what that even means. Every day I am reminded what a heavy dose of pop culture comes with public education. I’m left with a lot of questions about how we as parents help our son navigate that, especially as the pop culture values seem to grow more and more divergent from our own. 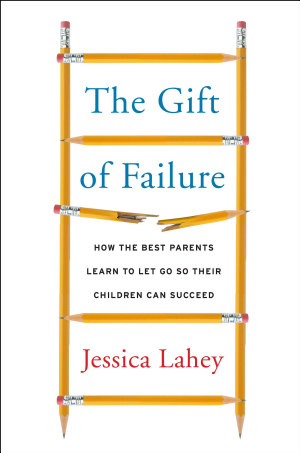 I recently read The Gift of Failure: How the Best Parents Learn to Let Go So Their Children Can Succeed by Jessica Lahey. This book offers an alternative to today’s overprotective, failure-avoidant parenting approach, which “has undermined the competence, independence, and academic potential of an entire generation.” Lahey begins the book by describing her dawning realization that she had been overparenting and chronicles some of her own struggles to grant her sons more freedom and more responsibility. She makes a compelling argument for allowing children the safe space they need to fail – and learn from that failure – at a young age when the stakes are still low. The controlling parent or the one who always comes to the rescue of her child is challenged to begin parenting for autonomy and competence, which involves setting clear and specific expectations, being physically and emotionally present and offering guidance when a child is frustrated or needs redirecting. She argues for giving children responsibility around the home as an important part of helping kids feel autonomous, competent and connected. In a discussion of motivation, the author describes how overparenting inhibits intrinsic motivation and essentially teaches children that without parents’ help they’ll never be able to surmount challenges. By protecting kids from failure, she argues, we’re communicating that we don’t have faith in their ability to overcome the challenges they face. Allow for mistakes and help children understand the consequences of those mistakes. Don’t offer to rescue your child from the consequences of his or her mistakes. Value the mistakes as much as the successes – in other words, support and love them just as much whether they’ve succeeded or failed. Acknowledge children’s feelings of frustration and disappointment. Provide feedback that supports effort and guides a child toward seeing his or her mistakes and then finding a workable solution. Praise kids for their effort, which encourages them to draw the connection between effort and capability. Encourage risk-taking in learning; fear of failure undermines education. Emphasize goals rather than grades. The Gift of Failure is a worthwhile read that may have you rethinking your expectations for your kids. It challenged me to consider what level of independence I will expect of my kids by the time they are young adults and to make parenting decisions in the present that will help them reach that goal. This school year, after reading the book, I’ve taken more of a hands-off approach to the getting ready for school routine each morning. My son packs his own lunch, though still with some supervision. He’s responsible for getting things into his backpack too. So far, he’s forgotten his homework at home once and forgotten a book that he was supposed to take to school. This is when my temptation to take over kicks in, but for the sake of fostering independence I’m trying not to. “Is quiet time done yet?” my recently-turned-five-year-old shouted from his room. “I want it to be. Make time go faster,” he suggested. That pretty much sums up how we tend to look at life for the first few decades of life, doesn’t it? It was the same son who just today said, “When I was four, I wished I was five, but now I wish I was six.” I remember couldn’t wait for the day when I started kindergarten myself. Then I always thought it would be better if I were just a few years – or even just one year – ahead of wherever I was at the time. “Why are parents sad when their kids grow up?” he asked last week as we were driving home from our morning volunteering gig. 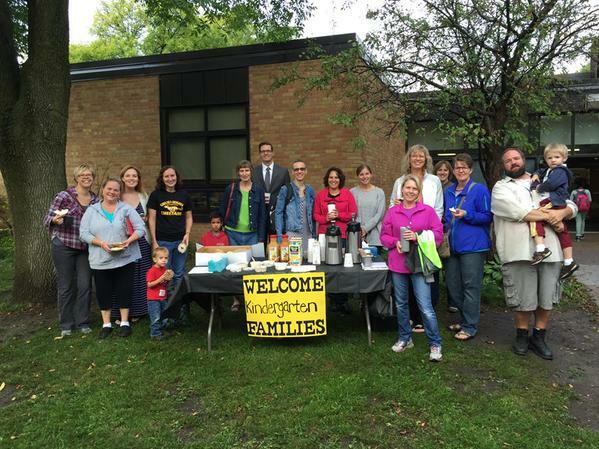 We’d been giving out coffee and bagels – and tissues – to parents on the first day of kindergarten at his brother’s school. We had just seen more than one teary-eyed, sniffling mom exiting the school building after dropping off a little one. This does not make any sense to someone who sees adding one more year to his age as a most desirable thing. In the weeks since his birthday, he’s reminded us several times that he is now five. Once his big brother took the opportunity to point out, “You know, you were a premature baby so if you were born for real, you’d still be four.” But he’s not going to dwell on that. He’s five and if it were up to him, he’d be in school now, just like his big brother. I’m still guilty of wanting to fast-forward through seemingly unpleasant periods. (I can’t count how many times I’ve started a sentence addressed to my husband with, “When you’re done with graduate school…”) But as I’ve gotten older, I more often have the good sense to enjoy the moment we’re living, to savor it because it won’t ever be quite like this again. Who knows how much longer my son will hold my hand as we walk together? (Some days he already doesn’t want to.) Who knows how much longer it’ll be that my boys come to me first with nearly every question or random thought they want to share? Such are the gifts of this season. A little something I wrote for our PTO newsletter. Your child chooses several countries he’d like to visit and makes an itinerary. For the first stop on the virtual vacation, he reads about the climate, culture and customs of the country. Together prepare a typical meal from that country and then your child can share some of what he’s learned about the place and perhaps teach everyone a few words from the language. Enjoy a folktale, book or movie set in that locale. The next week, repeat with the second country on the itinerary and so on, until you’ve finished your international virtual vacation. Don’t let your child just consume entertainment, suggest she create her own. She can make a movie, develop a board game or write a play to perform with friends or siblings. It may be fun to try her hand at making number puzzles or word games. Book making is another option. Brainstorm ways she can share her final product with others. Kids learn about responsibility by taking care of living things. Suggest your child choose a vegetable or herb for planting if he would like to enjoy the fruits of his labor. If outdoor space is limited, fill a large container with soil and try planting a cherry tomato. Or grow some herbs on the window sill. Summers are short, so make sure to provide ample time for outdoor fun. The Centers for Disease Control and Prevention recommend children get at least 60 minutes of physical activity a day. While some children naturally want to keep moving and easily get in an hour of exercise, others may need a little encouragement. Look for new activities to try and repeat favorites often, whether that be a nature walk, a bike ride or a certain sport or active game. Help your child gain life skills and compassion through helping others. Volunteering together helps your child understand the importance of giving back to his community. Whether you choose to pick up trash at a park, pack meals at Feed My Starving Children or collect supplies for an emergency shelter, volunteering helps stave off a sense of entitlement. Find local volunteer opportunities at an online site such as Hands on Twin Cities.